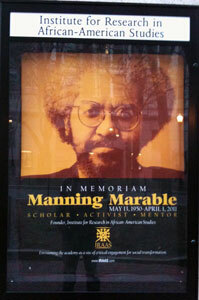 The scholarly world was shocked two weeks ago by the death of Manning Marable, a mere three days before his life’s work was to finally come out. Others have done a far better job than I ever could of explaining Dr. Marable’s importance as a scholar, activist, and teacher. My hope here is to recount just a little bit of the effect he had on me as my teacher and mentor. More of these stories can be read here. There have been a number of times in my life where I felt like a fraud. Quite frequently, I wonder if everything that feels like success in my classroom are mere surface victories, hiding more fatal failures beneath them. But never have I felt like more of a fraud than when I began my masters studies at IRAAS: the Institute for Research in African American Studies at Columbia. There were maybe seven of us starting the program together in the Fall of 2005 when all the professors came out to greet us at our first meeting. Each was introduced in turn by Dr. Steven Gregory, the graduate student adviser. The final introduction was of the man sitting in the corner. All the other students seemed star-struck by him, and I looked forward to finding out who he was. But Dr. Gregory merely pointed to him and said, “And of course, he needs no introduction.” Too embarrassed to ask, I had to wait until I got home that night to find out that the man was Manning Marable, and that I had no idea who he was. Throughout the year, I would learn that I had been welcomed into the presence of one of the most important historians of the black experience in the United States, and undoubtedly one of the top three black historians in the country. But moreover, Dr. Marable was a man deeply rooted in the community and its history, counting amongst his friends not only scholars like Cornell West and Eric Foner, but also activists like Amiri Baraka and Myrlie Evers-Williams, the widow of Medgar Evers. I knew I was lucky to have ended up at IRAAS (and it would turn out to be one of the most important experiences in my life). But as a white boy from Ohio entering a Black Studies program in Harlem, I felt a tad out of place at first, and the fact that I didn’t even know the giant of the field made me feel completely unworthy. None of that ever mattered to Dr. Marable though. He quickly took an interest in me, my work, and the research project I wanted to undertake, especially after I discovered two archives in Charleston that had never been used by historians. He became my thesis adviser, and saved countless hours for me in his office, to discuss the challenges of writing the history of people who left behind few documents. Dr. Marable had spent his life proving one of his professor’s wrong when he was told as a student that “Africa has no history” because it lacked a written record. He helped me assemble the story from a wide variety of sources of two remarkable teachers, Septima Clark and Bernice Robinson, who created a system of adult literacy Citizenship Schools throughout the south in the 1950’s and 60’s that would eventually prove to be the backbone of the Civil Rights Movement. I am honored that he saw fit to include part of this story in what will be the final book that he edits, The New Black History, coming out later this year. When I started the program, I thought my time teaching history was behind me and that my future would be in English classrooms. After my experiences teaching in Virginia, I questioned the importance of teaching history, particularly for students with low reading and writing skills. Dr. Marable made me realize the value of teaching history though, particularly for students of color in the United States. His view of a Living Black History, both as a narrative and a historiographical approach, fundamentally affirms the daily lived experiences of a people whose history is perhaps the foundational story of America, though is rarely seen or taught that way. Dr. Marable’s work showed that black history is not merely something to be recognized one month out of the year, but rather as the core thread of the American experience. More importantly, along with a generation of scholars, he developed a methodology that allowed stories that were often “forgotten” to be reclaimed and shared with wider audiences. He fundamentally changed the value I thought history had for my students, and gave me the reason, vision, and purpose I needed to return to the history classroom. He taught me how to think historically, and I hope I have been able to share those lessons with the five years of students I have taught since. Dr. Marable used to tell us the story of the turning point in his life. When he was a teenager in Ohio in 1968, his mother put him on a bus to go to Martin Luther King’s funeral. He talked about that both as the moment when he realized he was part of a people and their history, and that it would be his life’s work to document the history of his people’s struggle for freedom. There will be a public memorial service for Dr. Marable on Thursday, May 26, 2011 at Columbia University’s Alfred Lerner Hall-Roone Arledge Auditorium at 5:30 PM. I will be bringing some of my students for whom I hope this might be a similar experience, and I would encourage other teachers in the area to do the same with theirs. Beautiful tribute. Can you please send me an email? I wanted to follow up with you regarding an IRAAS initiative regarding Dr. Marable.